Lieutenant Joseph from Orange City Fire and Rescue critiques a group of students on the placement of straps. Cervical collars and straps in hand, the Orange City fire and rescue prepared to demonstrate c-spine to biomedical academy students of levels one and two on Friday, Jan. 18. 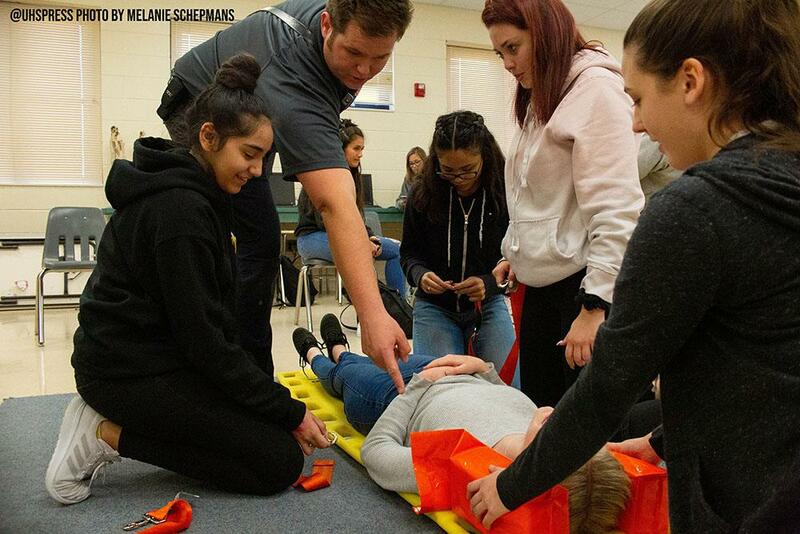 The lesson engaged students as they practiced properly immobilizing a victim with a cervical injury by strapping classmates onto long back boards that would prevent further damage with transportation from the scene to the hospital. Biomed teacher Perry (Doc) Revlett expains the importance of a tightened strap to a group of students. Biomed teacher Perry “Doc” Revlett brings professionals from paramedics to EMTs into the class to provide hands on experiences and lessons that will benefit students in their lives. Even if students do not choose to pursue a career in the field of medicine, they are gaining useful skills that enable them to save lives.